Life Insurance Prospecting Habits | Techniques, Tips, Concepts and Ideas. Prospecting and generating sales leads is the foundation to being a successful insurance agent. Today is just another day in the insurance business. If your number one problem is going to be - who am I going to call on, and where can I get some fresh life insurance prospects? Then you have a life insurance prospecting problem. If this is where you are in your insurance career, then you need to review and clearly understand how the prospecting ladder works. Knowing where you are on this ladder will help you determine what your next step should be. You already know that each and every week, you must create a new inventory of names to call. At a minimum, you must replace the names you called on last week. If you run out of inventory (names to call), you are unemployed. So what do you do! Where do you start? The difference between having just a name to call, or a qualified prospect to call is that there must be a need, or a special event in a person’s life that you are aware of, that will motivate that person to want to visit with you about buying life insurance and willing to take the time to visit with you. Selling life insurance and life insurance prospecting requires new and existing insurance agents to incorporate and fine tune many of the proven marketing concepts available to help them become successful. Many of these concepts are located on this webisite. Your number one priority to selling insurance is that you must learn how to prospect by developing a *prospecting system and have a positive prospecting attitude. 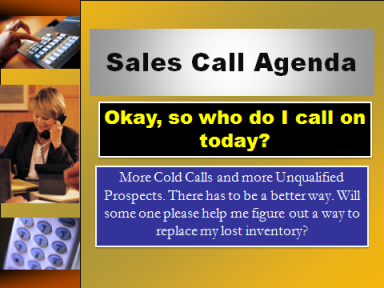 Lets look at some ideas to increase your prospecting skills? First of all, you probably have gone through some type of life insurance training program with your company. During this life insurance training program, your manager has probably attempted to show you some good life insurance prospecting ideas and life insurance marketing ideas to help you sell life insurance. He also probably showed you what you need to do, to develop good life insurance prospecting habits. If you are having a problem in this area, you may want to revisit this part of your training with your manager. The inability of learning to create a continual list of life Insurance Prospects to call is probably where most agents fall down on the job in the sales business, causing them to fail. They do not want to, or know how to dedicate the time to put in place a good life insurance prospecting system to generate inventory. So what is the real story on how to get life insurance leads...........? Any life insurance prospecting system you set up, must be able to generate and develop the names of qualified prospects to call. It is something that you must do, each and every day, week and month on a religious basis. Insurance prospecting is a 24/7 requirement, when you are in the insurance sales business. We will talk about that in another section, but remember that, 24/7 concept. It is part of your life support system. First of all, anyone can get or buy a list of names to call. However,this is the coldest form of a prospect to call on. We should want to call on people that want to see us. People that may have a need for our product and our service. Doesn't that make sense? you must learn to prospect or you die. The difference between having a name to call, or a prospect to call is there must be a need, a special event in a person’s life that you are aware of, that will motivate that person to want to visit with you about buying life insurance and want to take the time to visit with you. so how do we turn a name into a insurance prospect? where can you get qualified leads? How do you generate enough inventory every week to stay alive? the number one best way to get leads is the referral process. But this takes a little time to get this system up and running. without yet having a good referred lead program, a new person coming into the business , or an existing agent that may be struggling is going to have to call a lot of people to get one interview. So the question is how do you continue to generate the required inventory of names to call, week in and week out? to Determine your life insurance prospecting requirements requires good record keeping. The sales business is a numbers game. There are no shortcuts, just hard work when starting out. Okay, now the question is where do I start? What are some places I can go to for prospect names? When it comes to insurance prospecting, there are many different approaches. When you are first starting out, many companies give you a booklet to fill out with all the people you know and then you rate them. This is a good way to start. New agents coming into the business usually grew up in the area they will be selling in which means they may have a lot of personal contacts and friends they can sit down with when getting started. But because they do not have as good referred lead talk system, they squander away these valuable prospects and the opportunities to get referrals from them. Community lists, little league lists, scouting lists, etc. Fair booths or a company booth set up at special events. Development of a good Life insurance prospecting system will be your key to success. One of the big problems a new agent faces today is the do not call list. This adds to the burden of calling people. You will need to check on how your company handles that. I have heard that if you call using the survey format, you may not be violating the do not call rule, but you should check. However existing company clients are exempt, as they are already a customer. When I first started out in the business, I had just moved to a new city and knew no one. Knowing what I know today, after being in management, and recruiting hundreds of agents, I would have never hired someone like me at that time. No market! Since I had no contacts or friends, I had to improvise and look for a market to get me going right away. In addition to sending out money mail, pre-approach letters (cold Call Names) I decided to go to the court house and start getting the names of newly weds and baby births. (I read about this idea in a target marketing book) This was public information. These were people that had that new need or special event happen in their life. Once a week I took my 3 X 5 cards and went to the new births section and copied down as many names as possible and used those names to send out money mail or pre-approach letters to the following week. Additionally, I would go down to the local court house every morning around 9 am and get the most current new marriage license names and go seek them out and then come back around 1 pm in the afternoon and get any additional names that signed up in the morning, and go after them during the afternoon or evening if I had no appointments set. Upon getting those names I then drove directly to the address that they gave on their wedding license form and tried to locate those individuals and set up an appointment. For newly weds, I use to contact them about a starter family insurance plan putting coverage on both of them. My purpose was to get a new client and grow with them throughout their financial lives. I also found out, that when calling people on the phone it was easy for them to say no to an interview, but eyeball to eyeball it was a lot harder for them not to grant me an interview. The interesting thing about going eyeball to eyeball and attempting to make physical contact, there were many times I came into contact with the parents or a sibling. And when I told them what I do, sell life insurance, they would ask me to sit down with them to discuss some insurance needs, or I would bring up some key questions to try and get an appointment with them. I made many sales in my early career using this target marketing concept. Since that eyeball to eyeball concept worked so well, I started to take a walk down the street in quality neighborhood and knock on the doors to introduce myself and drop off my card. I learned real fast that sitting in the office and hoping for someone to call me back or sitting there trying to think about shortcuts on how to get people to see me was not going to work. As time went on and I developed my client base, it became more effective for me to start using the telephone to develop appointments, because I started generating more referrals and created more existing client business, etc. I hope you find your prospecting success formula fast. take the time to Learn the referred lead card system. you will be surprised what happens.